Odibo Review 2019: Is Odibo a Good Hosting? I signed up to Odibo, reviewed their unique features, tested how easy they are to use, checked with support on several issues, and tested the speed of the live site. When done, I tried to cancel my account and receive a refund. This is my experience with Odibo - I hope you can learn from it. 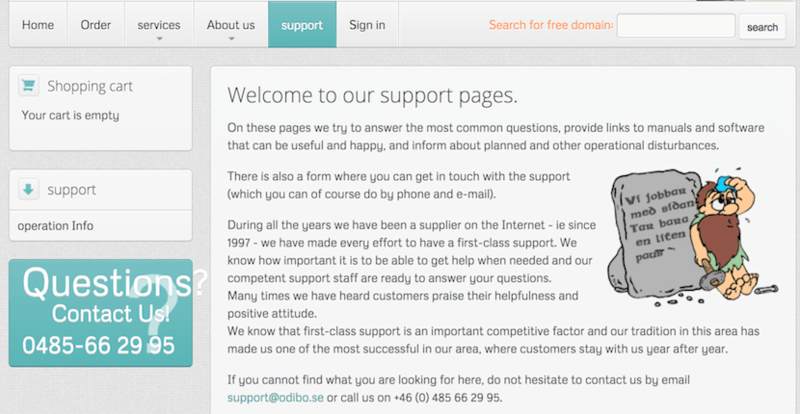 Founded in 1997, Swedish web hosting provider Odibo offers a number of I.T. services including web hosting, email hosting, domain registration, website design, SEO, programming, and more. It provides round-the-clock technical support and has been rated as one of Sweden’s most stable hosting providers. The Odibo website is in Swedish. Odibo’s shared hosting plans are offered at three levels: small, medium, and large. 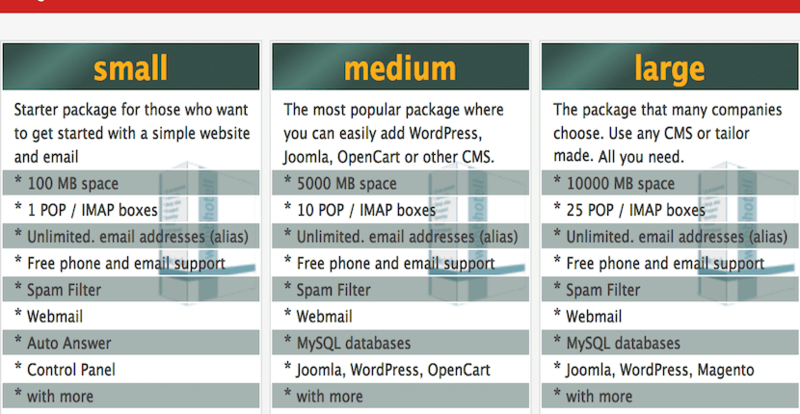 The entry-level small package includes a minuscule amount of data that will be suitable for only the simplest website. It comes with 2,000 MB of bandwidth, 100 MB of storage, one POP/IMAP mailbox, and free customer support, but does not allow you to host WordPress, Drupal, or another CMS. With the medium plan, the resources increase to 10,000 MB of bandwidth, 5,000 MB of storage, 10 mailboxes, MySQL databases, and the ability to host WordPress, Drupal or other CMS software. If you want a website built for you, Odibo offers website design services and an all-in-one package. With the web design service, you can choose a website template, then let Odibo customize it to your tastes, set it up with your domain name, add your logo, and configure any email accounts. This service comes with a 30-day money back guarantee. The all-in-one package is a managed website service which includes website design and setup plus SEO and ongoing management of security, software updates, website content updates, and email functionality. This service also comes with flexible payment terms and a money-back guarantee. Odibo’s hosting plans are pricey. The basic entry-level plan costs about the same as a mid-level plan from another top hosting provider, but with far fewer features. And Odibo’s mid-level plan costs around 300% more than similar plans with international hosts. Compared to top Swedish web hosts, Odibo’s plans are at least twice as expensive. For the unlimited resources offered by many competitors’ plans, Odibo’s plans cost 400-600% as much. The added-value website design and all-in-one web management services can be paid for by the hour, month, quarter, or year, depending on your needs. Odibo provides a number of I.T. services including basic web hosting. The entry-level hosting plan offers a minimal amount of data with no ability to host a CMS such as WordPress. Hosting prices are quite high across the board, and pre-sales support seemed to be unresponsive. For all-in-one website design and management, head over to Odibo. Wondering how Odibo stacks up against other Web Hosting companies? Enter any other Web Hosting company and we will give you a side-by-side comparison.